Thursday I was telling you that the latest TSJ ruling was probably a renewed attack against SUMATE. Well, it did not last long as already Iris Varela is calling for the head of Maria Corina Machado. In a way this is quite an unremarkable incident but in other ways it is deeply telling of the pebbles that bang each other inside chavista brains. Sometimes in Venezuela political reality is stranger than ideological fiction. In a particularly ironic and cynic turn Weil has Chavez dismiss the documents shown by Colombia at the OAS a few days ago by acknowledging that there is so many containers rotting food in Venezuela that surely it should appear in the FARC camp pictures. Do yourself a favor and start your week with a chuckle by reading how Larry Rohter trounces Stone's movie South of the Border and its script writers, Mark Weisbrot in particular, the darling of English speaking chavista whose economic predictions about chavismo prowess have all fallen flatter than the ocean's horizon. Once again, wasted propaganda money as the movie only preached to the choir, if that. Funny how any serious attempt at a movie flattering Chavez epic must always resort to quite a few misinterpretations and outright lies. Remember " The Revolution will not be on TV" or something like that about April 2002 who has disappeared from the radar now that it has been proven to be mostly a fake? Fortunately the word, in addition of diligent bloggers, provide great journalists able to finish off such people. Poor Chavez! He had to cancel his trip to Cuba to commemorate who knows what act of Castro heroism (Castro doe shave acts of heroism compared to the lack of these in Chavez) because an attack from Colombia is imminent. 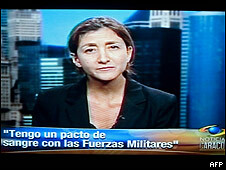 It is BBC mundo that tells us that, I suppose because they take Chavez words at their value. They also tell us that Chavez will stop selling oil to the US if necessary ans that we will be eating stones if necessary, anything to save our dignity. Well, the eating stones thing I got from a center right paper in Span, El Mundo, who loves to collects these cute sayings of Chavez. Apparently El Mundo also understands Chavez as saying that the Colombia presented evidence is just like the one for justifying Iraq. At least, if this is true, we can congratulate ourselves for the progress made by US intelligence services since now we have accurate map locations and plenty of videos and pictures, what was sorely lacking in Iraq. ¿Unas razones para la "intromisión" de Colombia en los asuntos de Venezuela? Sobre la ruptura de las relaciones con Colombia despues de la sesión de la OEA este jueves me han fascinado los distintos comentarios, sean los insensatos y violentos por parte de Cilia Flores, presidenta de la Asamblea Nazional de Venezuela, o de algún otro insensato comeflor, que se pierde en tecnicismos de que si los procedimientos de la OEA no fueron seguidos, de que si era la misma vieja historia repetida. Y se me ocurrió que casi todo el mundo no ve el bosque detrás del árbol. Lo que ocurrió ayer en Washington fue Colombia notificándole al mundo que una tragedia se está gestando en Venezuela y que no están dispuestos a asumir el costo solos. Empecemos por tres puntos básicos. Why Colombia did get so personal yesterday at the OAS? I have been fascinated by the different comments coming from everywhere, be it the insensate and violent ones from Cilia Flores, chair of the Venezuelan Nazional Assembly, or be they from some insensate "come flores" who wallow on technicalities that the OAS procedures were not kosher and that it was the same old story anyway. And it occurred to me that pretty much everyone is missing the forest for the tree. What happened yesterday in Washington was Colombia serving notice to the world that a tragedy is brewing in Venezuela and that they are not willing to shoulder the cost alone. Let's start by three basics here. Today's break with Colombia really leaves me ice cold. 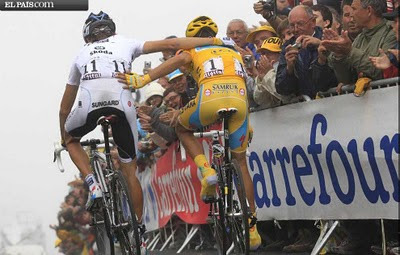 But what happened at the Tour de France stage today did run chills through my spine and I ONLY saw the picture sequence (I am at work, no broadband to watch the tour). Chavez breaks with Colombia for reasons of "dignity"
Now, the not surprising announcement might have carried some seriousness had it been pronounced without the presence of noted narco Maradona. I mean, please... if you are talking about "dignity" be dignified!!!! So, receiving Argentina failed technician at the World Cup, famous football player and famous ex (?) drug addict Maradona, Chavez replied to the accusations by Colombia that there are at least 87 camps inside Venezuela that are or were safe haven fr FARC and ELN guerrilla. The video is from Globovision, as a rebroadcast of whatever VTV signal is since they are the only ones allowed near Chavez. Observe, for fun, even if you do not understand Spanish, the Chavez show. An Uribe Santos spat behind the latest citation of Venezuela to the OAS? UPDATED. Do not count me in those who think the latest initiative of Uribe in bringing Venezuela to account for its harboring of FARC terrorists inside its borders is the sure sign of a rift between Uribe and his protege president elect Santos. The OAS session to deal with the accusations will be held next Thursday and one would think that sparks will fly. But thinking that this is the main show would also be a mistake. In a very extensive interview (sorry, it is in Spanish) Diego Arria explains himself, what motivates him and how he thinks he can take Chavez to the International Court of Justice at The Hague. A long but possible road in his own words. He certainly seems motivated and Chavez (or some within chavismo) must start to wonder if it was worth while bringing Arria out of his retirement by seizing illegally La Carolina. Working in Yaracuy is not without risks. Although now the crime rate per capita has nothing to envy from other areas of the country, it is also the coastal area state reputed to having the largest variety of snakes (the abundant rain in the Sierra de Aroa and Sorte, I have been told). Here at work, near some fallow land, we routinely kill mapanares and assorted cuaimas. But today it was a first, in a storage room not even 100 feet from my desk we killed this coral snake, about 40 cm long. Now, from Wikipedia I cannot tell for sure if it is a dangerous type of Coral, the most lethal species in Venezuela. But when you go to a storage area and start moving stuff around and see yourself in front of that the reflex is "kill" even though that unfortunate snake might be good for you as your local predator of vermin (it specializes among other things in snake and lizard eggs). Tal Cual's Weil nails it again. 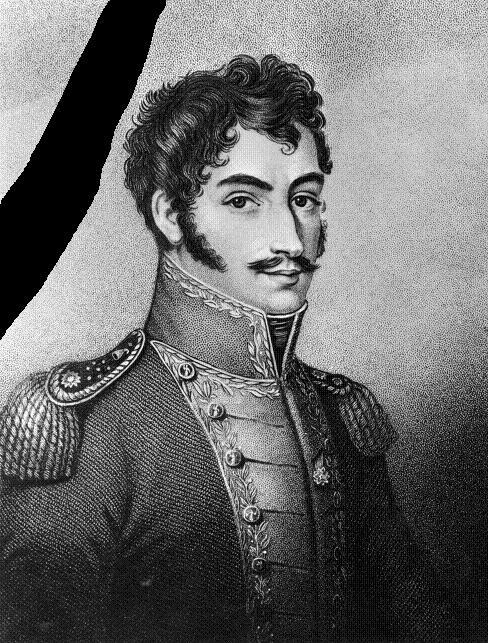 Last week we subjected to the horror of Bolivar's grave profanation. 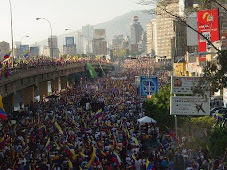 All decided of course to create a major scandal to distract the public opinion of a scandal that should have caused the resignation of the government: the loss of at the very least 120,000 tons of food imported for the humble people of Venezuela. Since Direct TV cut me off from the French TV world signal I have to rely on a trip to Caracas to watch some of the Tour this year. And it is as magnificent as ever, the filming crew becoming better if possible. Today he presented one of the old CADA markets he seized a few months ago as a new governmental success, an "abasto bicentenario". But that he is now stealing stuff to later pass it as his own creation is now just routine: where he really blew the gasket today was in telling us the future of La Güaira. Does the Bolivarian "revolution" respect Bolivar? The answer of course is NO. The pseudo revolution might venerate Bolivar, adore him, deify him, but it does not respect him. La primera vez por la muerte, la segunda por la pena ajena. A few days ago I had to go on an errand that took me into the bowels of Puerto Cabello, ground Zero of the now at least 150,000 tons of food that went bad because the government imported them without any control, the officials importing it only worried about their paybacks and not at all about distributing the food, etc, etc... I am not going to let you know what I had to do there because, well, I do not want to take any risk for the success of my errand. Neither do I have pictures to show you even though I had my camera. Thing went too fast when it was interesting to shoot, or too full of Nazional Guards and all sorts of Red shirted employees now that all the private sector service for the harbor has been banned. Still, I will have a short tale worth of your interest I hope. The judicial system of Venezuela is becoming such an embarrassment that one would rather not write about it again. But of course I do because I cannot resit every single opportunity to point out how low people like Luisa Estela Morales Lamuño and Luisa Ortega can fall, "las cachifas de chavez". Four items, listed in no particular order of importance. Guillermo Zuloaga went to Washington to the Inter American Commission for Human Rights, the OAS department in charge of Human Rights protection. He went there after having been in hiding for a few days. he went there to tell them that he wanted the Venezuelan government to exhibit its charges against him there. He cannot get a trial here of course, but he serves notice to the OAS that if something happens to him they will not be able to say that they were not warned. Now the IACHR is in the delicate position of having to issue a protection measure to Mr. Zuloaga so he can go back to Venezuela and face trial in fair conditions, which is what he wants. I cannot resist a last post on the World Cup, to review the image of Iker Casillas the steeled cry baby. If in the field as a team captain he managed from the goal posts to control the nerves of his team, his emotional inner dam eventually broke down. Not only he cried when Iniesta scored the goal that he knew the Dutch had no time to erase, but when he was interviewed by his girl friend (a Spanish reporter he met who knows in what locker room) he broke down again, kissed her and run away without finishing the interview. You should watch his gaunt face in the video (I cannot embed it for some reason) and then you will understand the toll it takes if you want to become a World Champion. Corny moment perhaps but oh so telling! 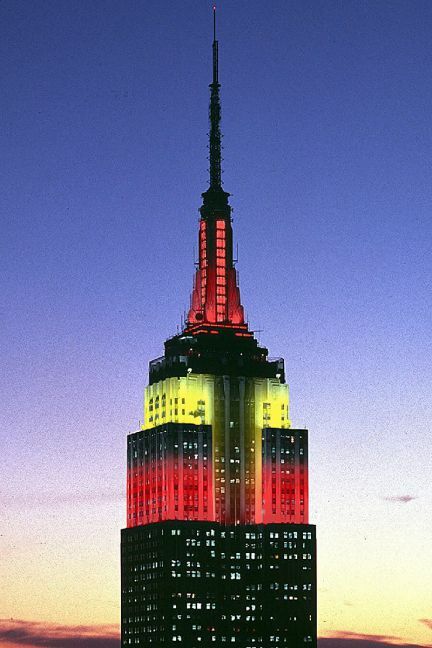 The other "moment" is the Empire State building sporting the colors of the Spanish Flag. Now, this is the best evidence I can think of to prove to my still skeptic US readers that soccer IS the world sport, even now in the good ole US of A. You are cornered, give it up! And to finish, heck, why not let it get to me join the crowd and say it: "¡Viva España, carajo!" A country where it is OK, and proud, to wear red: not Venezuela! The royals of Spain receive the World Cup champions. If I were a Spaniard I probably would wear red today, the first time I would since, oh, say, ¿2004? Now you see it, now you don't. After having asked 6 millions from the Colombian government now former FARC hostage, former presidential candidate says that she was misunderstood, that she was just trying to make a point and other utter nonsense. I mean, as I wrote before, even if she wanted just to make a point she should have proceeded in a different, more political should we say, way. Of course, the woman feels the heat when everyone lambastes her, from the outgoing vice president with choice words to pretty much any sinle newspaper in Colombia. So in a desperate damage control operation she even went to TV (CNN, RCN, what not) to say that no, it was not that way, she awas misunderstood, there is a blodd pact between her and the Colombian army, etc, etc. But it was not easy and the Dutch certainly showed that they were the worthier opponents of Spain in the whole joust. But the Dutch lost their nerve, there was a rain of yellow cards with the expected red expulsion card, a la Zidane four years ago. Great teams hold their nerves no matter what happens and that is why they tend to win. Though at least one of the Spaniards, goal keeper Iker Casillas could not contain his emotion in the last minutes of the match when Spain finally scored and the merciless cameras could not get enough of him crying like a baby even though I could not find a better picture of the moment than the one I posted on the right. Indeed I wonder how many people really weighed in the emotions that run in this final game of South Africa. Many try to pretend that it is all about football only. Might be true elsewhere, like in the European Cup, but there is always something extra that comes with a World cup that makes it so thrilling to watch even if the best technical football is what you see in the final European Club championships. But at the World Cup no one escapes the cultural and historical baggage that tags along. A little bit of vulgarity for a late Saturday night. I suppose that this piece of news should be put in the "Ripley's believe it or not" section. Former FARC kidnap victim Ingrid Betancourt has suddenly decided to sue the Colombian State for the a few million dollars because according to the plaintiff, the Colombian State is responsible for the FARC taking her as hostage. In spite of my many detractors, my prediction came to be: Spain beat Germany today and thus the final game on Sunday will be Spain versus the Netherlands. And to pat myself further, the way they won their semi final match is quite close of the way I envisioned it. Sometimes I delude myself into thinking that all of these attacks that chavismo does compulsively against anyone that looks at them slightly crossed are just political agitprop, that they cannot believe all the crap they say. But only too often in recent years I come to realize that the self brain washing within chavismo actually works, that these unfortunate people are starting to believe the crap they publish. Two examples today. It is The Netherlands! Led by a brilliant Van Bronckhorst! There was really no surprise. Uruguay did really the best it could and it was an impressive best, but the Oranje were simply the best team, no question. La llegada de la tierrita que supuestamente pretende representar a Manuela Sáenz, "la libertadora del Libertador", nos obliga a revisar el rol de las mujeres en la farsa bolivariana que tenemos ya bastante años padeciendo. Para muchos incautos el régimen bolivariano ha sido un avance para las mujeres. Ahora todos somos ciudadanos y ciudadanas, revolucionarios y revolucionarias y hasta malhechores y malhechoras demostrando claramente que la corrupción moral o material no es exclusiva al macho de la especie. El nuevo sainete que no ofrecerán este lunes 5 de julio, depositando esa tierra de Paita en el panteón Nacional, es mucho mas que simplemente honrar la memoria de Manuela Sáenz, memoria digna de honrar, pero no de ridiculizar. Empecemos pues revisando quien fue Manuela Sáenz. Sus títulos de gloria no son pocos. Ademas de haber servido de consuelo y compañera al Libertador, de haberle salvado el pellejo en Bogotá, también participo de las acciones militares que liberaron al Perú, obteniendo grados militares en el proceso. Esto habla muy bien de nuestro Libertador que para aquel entonces se había dejado de cursillerias y otras pendejadas, y valoraba las mujeres tanto por sus confesiones en el "boudoir" como por sus capacidades intelectuales y de acción. Friday and Saturday were for all practical purpose the end of the World Cup. True, there is that final matter in deciding who is the best team, but we can already take in all the lessons of this South African edition. South America (or the Americas?). In the final 8 we had 4 South American teams, all of the qualifying team but Chile. Asia was out, Africa could only send one. And if Europe sent three they were after yesterday, clearly, the three best teams in the world. That is, you can be the best continent but that does not mean you own the best team. Those are still in Europe, like it or not. Africa. We have been sold the idea that Africa football was on the rise, that the World Cup should go to Africa before it went back to South America, etc, etc... But the fact of the matter is that Ghana alone was a world class team; all the other were, well, I prefer not to say. Asia, or at least its Far East part, seem to have a better future than Africa. Whether we like it, being able to afford to establish local serious professional leagues is a must to eventually own a great team and, unfairly perhaps, no African Country can still do so and all depend too much on sending a player here and there to the European leagues. At least 8 more years to see a threatening Africa. UPDATED While I have distracted by other activities, chavismo has been diligent in voting stuff that should in theory ensure that Chavez retains power no matter what happens at election time. One of the things that has been pushed actively has been the "Poder Comunal", or commune power which in theory consists in bringing direct "democracy" at very local levels so that the neighborhood assembly is the one deciding on many things. I suspect that I will have to come back to subject this quite often so I will make this a simple introductory post explaining how the new system will result on Chavez obtaining more power than what he already has. This is done with two slides. Although the 1999 constitution is far from perfect it respected at least the conventional norms. For the sake of the discussion I pretend to believe in the separation of powers. The executive is divided in two portions which together represent the main power of the constitution. Tal Cual Weil characterizes it perfectly. "president, what can you tell us about...[cut]" "I am busy with bigger things... [insult allusive at you being a sold out agent of the US of A]"
In this image Chavez is inaugurating a small Mercal (abasto is the new code name for food store since the government is unable to make to supply them so that they could be called supermercados). One of the very many ways chavismo is trying to distract from the crude fact that enough food purchased by the regime went to rot so that it could have fed the Venezuelan population for about a month. and when any one tries to bring the topic to what really maters for the country, then it is a conspiracy, media manipulation, traitor to the fatherland and what not. I am not the one saying it, it is the New York Times under the pen of Simon Romero. The fact of the matter is that under any angle you try to look at it, Venezuela is sinking fast, with no hope of any significant recovery any time soon. And even the so much vaunted dubious health results are brought into question as numerous epidemics haunt us, from Dengue to Malaria to a slight tendency in an increase in childbirth death (heard on Union Radio this morning). Never mind our crime rate country wide whose numbers can only compare with the local Northern Mexico rates under drug traffic effect. Chavismo has been a catastrophic failure and yet too many people still do not see it. How come?